As many of my friends and peers already know, I took an academic sabbatical in the fall of 2015 to gain a Masters degree in Medieval History from King's College London. The courses were hugely challenging - especially Intermediate Latin and the Medieval Latin Translation Seminar - but also hugely rewarding. Dr Daniel Hadas edited my transcription and translation of the Carmen Widonis 25 lines per week during the academic year, allowing me to produce the most literal and accurate translation of the earliest and most detailed account of the Norman Conquest. I am particularly proud of re-interpreting the 1066 siege of London as resulting directly in the truce that yielded the Charter of London's Liberties, the first civil rights act to grant state prerogatives to a citizenry and the basis for a mercantile common law. I also change the landscape of the Norman Conquest, shifting the fleet landing, camp and battlefield into the Brede Valley, then a great estuarine sandy loch - Senlac. The republished work is now available on Amazon as Carmen de Triumpho Normannico - The Song of the Norman Conquest, which includes four appendices giving detailed original research into the backstory, motivations, geography and political context of 1066. Before I could get back to work in financial market infrastructures I was asked to undertake another history, and I couldn't refuse. Professor Charles Goodhart has been a friend and mentor since I first came to London in 1990. His contributions to the central banking world as chief economic advisor the Bank of England, founder member of the Monetary Policy Committee, and member of the Financial Stability Board are awesome. At 80 he is still going strong. Together we have produced A Brief Affectionate History of the Financial Markets Group, celebrating 30 years of the London School of Economics centre of excellence for the study of financial economics. Mervyn King, now Baron of Lothbury, was a co-founder of the FMG in 1987, and wrote the Foreword for the book. A very young Mervyn is also on the cover. 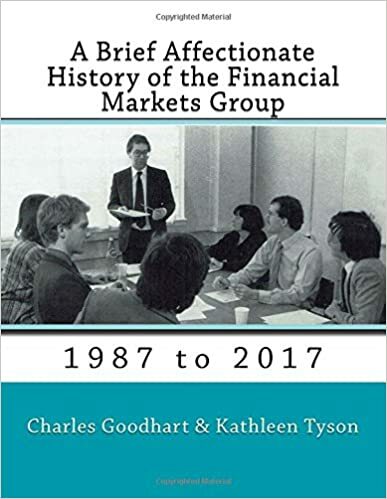 The book is unlikely to be of interest to anyone who wasn't involved in FMG over the years, but since there are over 1400 Economics professionals, central bankers, and academics who were involved in FMG, I hope some of them will enjoy it. In addition to reviewing the set up and participation in FMG, the lists of Discussion Papers and Special Papers offer a useful retrospective of the development of Financial Economics as a discipline. FMG has made a huge contribution to the complex models and rigorous methodologies we have today. In any event, it was lovely working with Charles, and proving a history degree can have some value. We've been wanting to write something together for years, and this was a great project for partnering our different skills usefully. Now I'm back and ready to take on the challenges of modernising financial markets infrastructures to meet the PFMIs and new regulations such as GDPR, PSD2 and Basel III+, as well as the evolving opportunities and threats of emerging technologies. Last year's paper on DVP on DLT: Linking Cash and Securities for Delivery vs Payment Settlement in Distributed Ledger Arrangements with Rise Technologies has had over 1000 readers, which is very good for a technical white paper, and I've published several recent topical articles on financial market developments in Financial World, so hopefully I can show I've stayed current with the infrastructure landscape of the financial markets while re-writing the landscape of 1066 and bringing the modern financial economics landscape into focus.